0 Comments Published by Cedric Benetti on Sunday, October 21, 2007 at 10/21/2007 04:53:00 PM. During the Franco-Prussian War, the building played a key role in several political events. On October 30, 1870, revolutionaries broke into the building and captured the Government of National Defence, while making repeated demands for the establishment of a communard government. 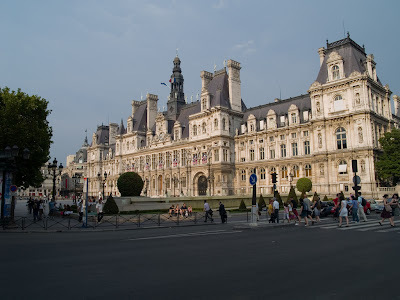 The existing government was rescued by soldiers who broke into the Hotel de Ville via an underground tunnel built in 1807, which still connects the Hotel de Ville with a nearby barracks. On January 18, 1871, crowds gathered outside the building to protest against speculated surrender to the Prussians, and were dispersed by soldiers firing from the building, who inflicted several casualties. The Paris Commune chose the Hotel de Ville as its headquarters, and as anti-Commune troops approached the building, Commune extremists set fire to the Hotel de Ville destroying almost all extant public records from the French Revolutionary period. The blaze gutted the building, leaving only a stone shell. The reconstruction of the building was directed by architects Théodore Ballu and Pierre Deperthes following an architectural contest. They rebuilt the interior of the Hotel de Ville within the stone shell that had survived the fire. While the rebuilt Hotel de Ville is from the outside a copy of the 16th century French Renaissance building that stood before 1871, the new interior was based on an entirely new design, with ceremonial rooms lavishly decorated in the 1880s style. Since the French Revolution, the building has been the scene of a number of historical events, notably the proclamation of the French Third Republic in 1870 and the famous speech by Charles de Gaulle on August 25, 1944 during the Liberation of Paris when he greeted the crowd from a front window. The statue on the garden wall on the south side is of Étienne Marcel, the most famous holder of the post of prévôt des marchands (provost of merchants) which predated the office of mayor. Marcel came to a sticky end, lynched in 1358 by an angry mob after trying to assert the city's powers a little too energetically. The current mayor, Bertrand Delanoë, a socialist and the city's first openly gay leader, shares some of Marcel's ambition and almost shared his fate. He was stabbed in the building in 2002 during the first all-night, city-wide Sleepless Night (Nuit Blanche) festival when the long inaccessible building's doors were thrown open to the public. But Delanoë recovered and has not lost his zeal for access, later converting the mayor' sumptuous private apartments into a crèche (day nursery) for the children of municipal workers. A display of cleaning material, with the always beloved Kaercher, a Sarkozy favorite!